M.U.S.C.L.E. or Muscle Men figures, are small collectable figures approximately 2in.tall and molded out of a monochromatic PVC gum. The name M.U.S.C.L.E. is an acronym for ‘Millions of Unusual Small Creatures Lurking Everywhere’ and they are based on an Intergalactic Wrestling theme. M.U.S.C.L.E. were sold by ©Mattel in the USA, Canada, United Kingdom & Australia from 1985 to 1988. However, they were originally released in Japan in 1983 by Bandai as a line of figures called ‘Kinkeshi’ which was based on the Manga stories of ‘Kinnikuman’. In 1984, Mattel were looking to launch a new collectable figure range and decided the Japanese Kinkeshi figures were the perfect line to launch quickly. Bandai produced the figures and licensed them to Mattel who would market them as M.U.S.C.L.E. However, Mattel required the figures to be manufactured out of a harder plastic, in a darker pink colour and also slightly larger in size. M.U.S.C.L.E. were based on characters from the Japanese cartoon and Manga stories of ‘Kinnikuman’ (literally ‘Muscleman’) It was created by Yudetamago, who are a duo consisting of story writer Takashi Shimada and artist Yoshinori Nakai. The Manga was published in Shueisha’s Weekly ‘Jump’ (see comic below). Kinnikuman was a much more detailed, ongoing storyline compared to the one-off basic theme Mattel gave M.U.S.C.L.E. Kinnikuman was originally created as a parody of ‘Ultraman’ (a popular Japanese show in the 60’s & 70’s). 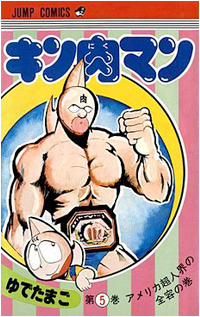 Kinnikuman (real name Suguru Kinniku) was a clumsy superhero who was only ever called upon to battle demons and monsters if no other superheroes were around. His powers came from eating garlic (ninniku), which would gradually fill a ‘garlic meter’ on his forehead and when the garlic meter filled up he would grow into a giant to fight the monsters. (all these figures were also available as M.U.S.C.L.E. but it should be pointed out that Buffaloman a.k.a. ‘Terri-Bull’ was the leader of the bad guys in M.U.S.C.L.E.). The basic M.U.S.C.L.E. story was still about intergalactic wrestlers but the characters names were changed, Kinnikuman was called ‘MuscleMan’ and Buffaloman was selected as the leader of the bad guys and renamed ‘Terri-Bull’. How many M.U.S.C.L.E. figures were available? The official Mattel poster shows 233 figures, but there are more! The Hard Knockin Rockin’ Wrestling Ring came with two figures not featured on the poster: ‘MuscleMan’ and ‘Terri-Bull’. The Terri-Bull was a completely new sculpt, while MuscleMan is a smaller version of the poster figure #141 but with a rectangular belt buckle. The Mega-Match board game came with a green version of the Terri-Bull wrestling ring sculpt but was unique to the game. The mysterious figure called Satan Cross takes the total official M.U.S.C.L.E. figure count to 236. What’s the story with the ‘Satan Cross’ figure? Over the years there have been reports about rare figures not found on the poster, but the only one that has been officially confirmed is ‘Satan Cross’. It has been officially confirmed because it has been found in sealed 4 & 10 M.U.S.C.L.E. packs. This designated the figure number #236. No one knows why Satan Cross was not featured on the poster, it could be as simple as it ruined the symmetrical layout of the poster or he could of been a ‘chase figure’. Satan Cross has a hole in his back, which in the Kinkeshi line has separate pair of legs which slots in to create a horseman style. The hind legs have never been found in the M.U.S.C.L.E. line and were most likely never released by Mattel, further adding to the mystery of this figure. What are the ‘Rare’ and ‘Super-Rare’ M.U.S.C.L.E. Figures? There have since been discoveries of what might be even more M.U.S.C.L.E. figures and if they are then they hold the distinction of being labelled ‘Super-Rare’ as only a few known examples exist. They have never been truly confirmed as authentic M.U.S.C.L.E. because they have not been found in sealed packaging like Satan Cross has, but they are worth featuring as they are great looking figures and have commanded astronomical prices since they appeared on the scene. They seem to be constructed of the same PVC plastic as genuine M.U.S.C.L.E. and are the same shade of pink. They also feature the trademark Y/S.N.T. stamp on their backs so they could well be M.U.S.C.L.E. but until they are found in sealed packaging we will never know for sure. jkaris, the owner of LittleRubberGuys.com purchased a 28 Pack of M.U.S.C.L.E. off an online Japanese auction and discovered 11 figures that are not featured on the poster. They all had the Y/S.N.T. stamp and were all in the M.U.S.C.L.E. pink. They have subsequently been named ‘The Magnificent Eleven’ and are all pictured below along with the other Super Rare figures. A more detailed write up on the Super Rare Figures can be read over at The University of M.U.S.C.L.E. What is the M.U.S.C.L.E Figure Classification Guide? Class A, Class B, Class C. These groups help differentiate how common or uncommon the figures are. Colours with a box around them indicates the figure was not produced in that colour. What is the Y.S/N.T stamp on the backs of M.U.S.C.L.E.? Y = Yudetamago – Authors of the Kinnikuman Manga volumes. S = Shueisha – The publishing company of the Kinnikuman Manga. N = NTV – The Japanese television network the anime was broadcast on. T = Toei – The animation company that produced the Kinnikuman anime. What packaging did M.U.S.C.L.E.s come in? M.U.S.C.L.E. figures were available in three assortments: 4 Packs, 10 Packs (Trash Cans) and four different 28 Packs. With the 4 Packs you could see which figures were getting, whilst the 10 Pack Trash Can was opaque so you couldn’t really make out which figures were inside, although if you are familiar with the figures you can make them out by shaking it around a few times. The 28 Packs had a die-cut window which allowed you to see about seventeen of the figures. What M.U.S.C.L.E. Accessories were available? Which M.U.S.C.L.E. Figures and Accessories are common and rare? Some M.U.S.C.L.E. figures and accessories might be considered hard to find, but since the vast majority of M.U.S.C.L.E. products were mass-produced there will be many figures and accessories hidden away in attics and basements across the world not available due to non-collectors not being aware of a waiting market. Then there are the veteran M.U.S.C.L.E. collectors not wanting to sell their prize figures or mint condition accessories that they have spent the time and money to accumulate. What’s the difference between M.U.S.C.L.E. and Kinkeshi figures? There is quite a noticeable difference between M.U.S.C.L.E. and their Japanese counterparts. Kinkeshi are smaller, made from a softer rubber and are lighter in color as you can see in the pictures. Kinkeshi were relased in various colours that M.U.S.C.L.E. were not, such as yellow, white and a darker green and the line had over 400 figures to collect compared to M.U.S.C.L.E.’s 236. Its interesting to note that Mattel had Kinkeshi figures in the early M.U.S.C.L.E. advertisements which suggests that either they were planning on releasing all the figures at some point or they were just the only figures available on the day of the photo shoot when they were creating the marketing. There probably was an intention to release more figures from the Kinkeshi line but the popularity dropped with the rise of Nintendo so they were never put into production. One theory is that Satan Cross might be one the characters that was going to be part of the next wave of figures. Overall, M.U.S.C.L.E.s are made to a higher standard. The plastic is harder and the detailing of the mold is more defined, they just generally feel of much better quality than Kinkeshi or any bootleg. What do fake M.U.S.C.L.E. figures look like? 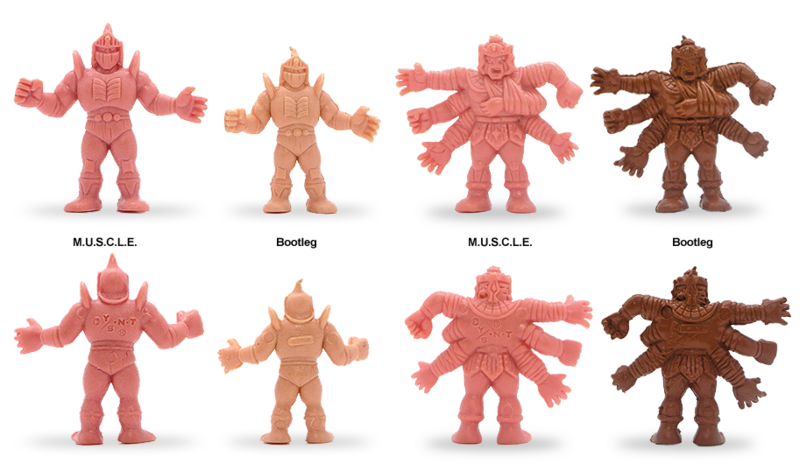 Fake M.U.S.C.L.E.s, also called ‘bootlegs’ are generally a much lighter colour and are made out of a cheaper plastic than M.U.S.C.L.E. plus the molding is poor. Bootlegs are also usually smaller than M.U.S.C.L.E.s but not always. A fake M.U.S.C.L.E. figure will never have the Y/S.N.T. stamp on their backs and they also come in different colours that M.U.S.C.L.E. were never produced in such as dark brown. You shouldn’t have trouble spotting a bootleg at first glance, but if you are unsure just check the reverse of the figure, most of them have China stamped on their backs!